Batch Replacer for MS Word is a utility which helps you perform multi-replacement operations in MS Word Files with the help of an MS Excel list. It can really save a great deal of time: no need to open each file and make a replacement and then open another file and so on. All this can be done in a few seconds and with as many Files as desired. Advanced word files combiner tool is an able to combine multiple word documents into one word document without losing your data. 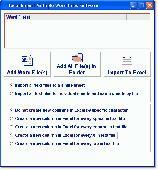 This Combine MS Word 2003 documents tool can easily combine word documents created using MS Word 2010/2007/2003 & 2000. Batch Word Power Tool is a comprehensive tool contains many useful command sets used in daily life. It is very important for persons worked on multiple word files every day. It includes word track changes, object removal tool and many other commands. Import one or many MS Word files into a blank MS Excel file. Specify local Word files and either insert them all into one sheet or individual sheets per file. If you have multiple word files and you can not manage them. Word doc file repair software is used to rescues most unopenable Microsoft Word files, and makes them openable. Convert one or many Word files to HTML files. Word 2000 or higher required. Extract email addresses from one or many MS Word files. Results can be saved as a text file. Compress the file size of one or many Word documents. Some Word files do not reduce as well as others. Results may vary. Word 2000 or higher required. .
Split results of a mail merge (one file) into individual MS Word files. Word 2000 or higher required. 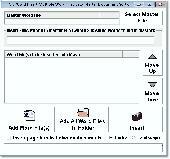 Repair Word Software is a dominant repair tool to repair corrupted or damaged DOC, DOCX files. Repairs and recover text, OLE objects, formatting, fields including hyperlinks from damage MS Word document DOC, DOCX files. Batch word highlighter is an apparatus designed to highlight words in multiple word files. Users can highlight words in thousand numbers with the help of this tool in numerous word files within seconds. This software offers a solution to users who want to count pages, words, characters, paragraphs and lines in one or more Word files. The user can specify a list of files or an entire folder to be processed. Word To PDF is a very powerful tool to convert bulk Word files to PDF , it does NOT need Adobe Acrobat software.